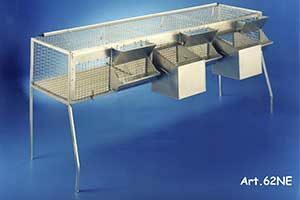 Cage for hens, entirely realized and built in Italy, using hot-dip galvanized grids with a high level of resistance. The cage has three compartments and a slide, which accompanies the eggs to the external part for an easy withdrawing. It is complete with a lower tub (pan) for a comfortable cleaning. It has a feeder and 1 m drinker. The ceiling of the cage is in mesh and it can be completely opened with closing and security spring. 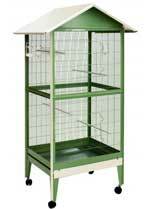 This cage is stackable and supplied dismounted with assembly kit. 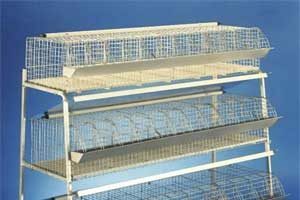 Cage for chicks, entirely realized and built in Italy, using iron and hot-dip galvanized grids with a high level of resistance. 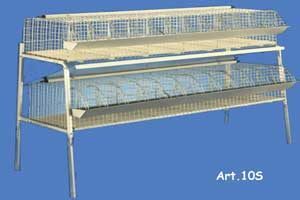 The cage is equipped with a frame complete of lower collection tank ( pan) of 1 m feeder and of a bottle-support drinker. The ceiling of the cage is in mesh and it can be completely opened with closing and security spring. The bottom is made with a tight knit mesh. 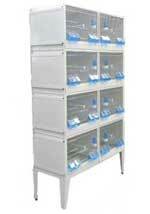 This cage is stackable and supplied dismounted with assembly kit. 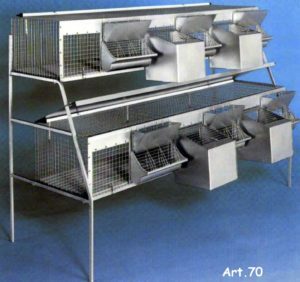 Small cages for rabbits in three versions entirely made and built in Italy, by using iron and hot-dip galvanized nets with a high level of resistance. The cage is equipped with a frame complete with a slide (pan), a hay feeder and a feeder, a bottle-drinking trough. 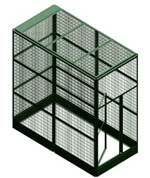 The sky of the cage is in mesh and can be completely opened with closing spring and security. 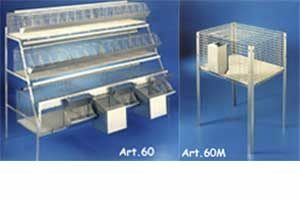 The cages are stackable and are sold disassembled with assembly kits. They mount the nest mod. 39. 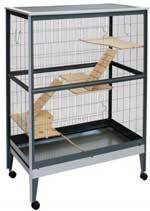 Cage for rabbits fattening on two floors entirely realized and built in Italy, by using hot galvanized nets and sheets with a high level of resistance. Front side with double closing effect of the feeder and the cage. Complete with bar for drinking troughs present in every single box, plastic bottom (PL). The possibility of having the bottom made of mesh is an option. The 90 cm supports are included (for references and prices of the easels, page SUPPORTS of this catalogue). 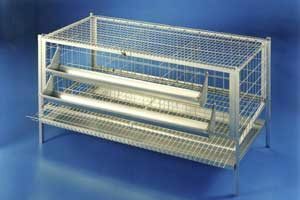 Cage for rabbits fattening on two floors entirely realized and built in Italy, by using hot galvanized nets and sheets with a high level of resistance. Front side with double closing effect of the feeder and the cage. Complete with bar for drinking troughs present in every single box, plastic bottom (PL). Comfortable sheet metal slides allow dirt to fall behind the unit for constant cleaning. The possibility of having the bottom made of mesh is an option. The 75 cm supports are included. Cage for rabbits fattening on three floors entirely realized and built in Italy, by using hot galvanized nets and sheets with a high level of resistance. Front side with double closing effect of the feeder and the cage. Complete with bar for drinking troughs present in every single box, plastic bottom (PL). The possibility of having the bottom made of mesh is an option. The 90 cm supports are included. 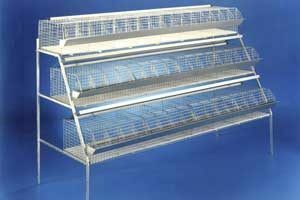 Mixed rabbit cage on three floors, entirely realized and built in Italy, by using hot galvanized nets and sheets with a high level of resistance. Front side with double closing effect of the feeder and the cage. Complete with bar for drinking troughs present in every single box, plastic bottom (PL). 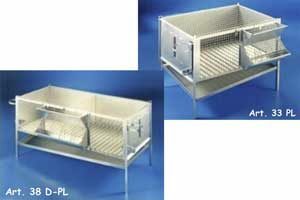 Comfortable sheet metal slides allow dirt to fall behind the unit for constant cleaning. On the lower floor, there is a three-seat mare zone and on the two upper floors, there are fattening baskets of your choice. The possibility of having the bottom made of mesh is an option. The 90 cm supports and the slides are included. Cellular castles entirely realized and built in Italy, by using hot galvanized nets and sheets with a high level of resistance. Front side with double closing effect of the feeder and the cage. 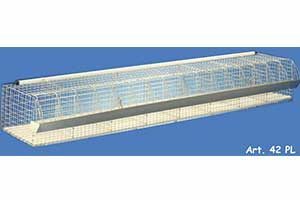 Complete with bar for drinking troughs, plastic bottom (PL) or optional mesh bottom. Supports not included. 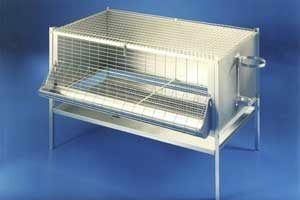 Cage for rabbit broods, entirely realized and built in Italy, by using hot galvanized nets and sheets with a high level of resistance. Front side with double closing effect of the feeder and the cage. Complete with bar for drinking troughs and plastic bottom (PL). Battery for the rabbit brood group. 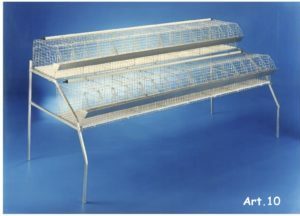 Rabbit brood cage on two floors, entirely realized and built in Italy, by using hot galvanized nets and sheets with a high level of resistance. Front side with double closing effect of the feeder and the cage. Complete with bar for drinking troughs and plastic bottom (PL). Supports included. Sign up to our newsletter! News and promotions from the world of birds and rodents.